When we are closed please contact the NHS 111 service who will be able to signpost you to the appropriate service. Appointments are available 5 mornings and 5 afternoons every week. You may make your doctor’s appointments and order your repeat prescriptions on-line via the link at the top of this page. Please see the receptionist for details on how you can do this. Patients will be offered routine appointments at the earliest opportunity with the doctor of their choice. However, delays may occur due to the availability of their preferred choice. Each GP appointment is 10 minutes in duration. Therefore we request only one problem per each GP, appointment please. You can also book appointments up to several weeks ahead. Appointments for patients who need urgent medical attention will be given priority and this may lead to delays. All children under 5 who have an urgent problem will be seen on the same day as presenting. Surgeries will begin on time and consultations will be kept as close as possible to the appointment times. Delays will be due to medical necessity only. If you feel that the doctor may be able to help you via a telephone consultation then these can booked at the end of each morning surgery sessions with the doctor on call. A chaperone service is available for any sensitive consultation. Please ask at reception or mention it to the doctor. If you require an interpreter please contact the reception staff to make the necessary arrangements. Face to face interpreters for all languages including British Sign Language are available to book with 48 hours notice. Please ask at the reception desk. If you cannot attend an appointment for any reason please inform us as soon as possible in order for us to give the slot to someone else. It is possible to leave an answering machine message to cancel your appointment at any time of day or night, simply telephone 0116 3662020 and select the option to cancel an appointment. Alternatively you can text your appointment details to 07462126396 to cancel. Please note, this number is for receiving texts only. 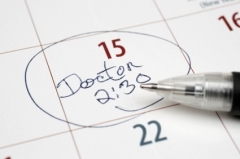 A record is made onto each patient’s notes that do not cancel their appointment and fail to attend. It is an unacceptable waste of clinicians time. The patient’s record is then reviewed and persistent offenders maybe removed from the Practice List.